QR Inventory is an accurate and easy to use inventory and asset management software for small and medium-size business. QR Inventory uses mobile phones, tablets, QR codes and NFC technology to bring advanced inventory / asset management to businesses of any size. QR Inventory keeps track of all information about the items that your company makes, buys, stores, rents or sells. You can track what project inventory was taken to, who sold a product, how many items will expire soon, or anything else you need for your business. You define everything that you need to track about your assets and inventory using the web interface. QR Inventory helps you maintain the most effective stock levels, and see inventory trends at a glance. It knows exactly what you have on hand, where in the warehouse is it and who has taken what out for a specific project. It will alert you when it's time to re-order stock and supplies. You do not need to purchase expensive barcode scanners / NFC readers / mobile computers to use with QR Inventory. The system uses any Android or Apple device (iPhone, iPad, android smartphones or tablets) for scanning. You can use QR Inventory at any location: in the warehouse, at client's shop, in the field - away from office computers and internet connection. 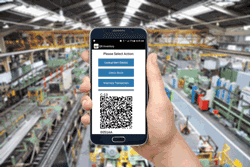 Use of regular barcodes, QR codes or NFC tags allows you to process asset and inventory transactions fast and error-free by scanning an item rather than manually keying in data. Talk to us to see how QR Inventory will fit into YOUR business.